A sole real ale, Doom Bar alone. Looked closed but on arrival, there were three men at the bar end, listening to 70s 80s rock music on the jukebox. Silence, not seen since those two backpackers entered the slaughtered lamb in american werewolf in london. Even the tracks changed on the jukebox. Doom Bar was not the best. The Black Horse is back to being just the Black Horse again (no Hoodens), and back to being a fairly normal local. Good for a summer day pint while the kids play outside (bouncy castle was up most of summer 2016), there's an occasional pub quiz and they also sell pizzas from the village pizza place, and have a pie&mash van outside sometimes. Pool table is usually available, and there's sport on the screen for those who want to watch it. Beer is OK, wine is from miniature bottles like you get on a plane, so I don't think they get many wine drinkers in! 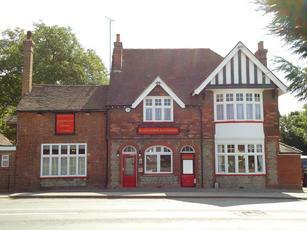 Alison Pilkington no longer runs this pub, leaving in April 2013 when a new management took over. The unusual range of beers do not seem to be available. Awful establishment. Full of youngsters bang out of their minds on drugs. I am surprised the toilet door doesn't fall off of it's hinges. The toilet is busy as a bee's nest. Alison has done wonders for this place. It used to be the sort of establishment I'd decidedly have thought twice about before entering; now it's a really top-notch village local, by far the best place to drink in a village which not so long ago had at least 6 pubs and now (I think) has only 2. Very pleasantly decorated, there's plenty of space but a warm cosy atmosphere. The beer has always been in fine nick whenever I've been in, with Old Dairy Red Top as the regular house beer, and varying guests. No food now, I believe - but that can be an attraction for some, if the opposite for others.